“Welcome to the first European XFEL Users’ meeting with actual users!” said Martin Meedom Nielsen, head of the European XFEL Council as he opened the three day event on 24 January in front of a packed lecture hall on the DESY campus in Hamburg. With 1200 registered participants from ca. 100 institutions from 30 countries, this year’s joint European XFEL and DESY Photon Science Users’ Meeting, the first since operation of the X-ray laser facility began, was the biggest yet. Meedom Nielsen and European XFEL Managing Director Robert Feidenhans’l started the meeting by summarizing the achievements and developments of the last year and thanking everyone who had contributed to the facility’s success. “It has been a fantastic year,” said Feidenhans’l looking back on his first year as director of the facility, “a tough year and we have worked really hard, but a fantastic year.” “2017 was a year of glorious firsts,” said Meedom Nielsen, highlighting especially the facility’s inauguration in September and the beams of laser light that shone across the city to mark the occasion. “Hamburg was shining for European XFEL, and European XFEL was shining back” he said. During the first round of user experiments from September until December 2017, European XFEL hosted a total of 341 researchers in 14 interdisciplinary and international teams. Since the beginning of operation in September, some 700 terabytes of data have been collected and the first results produced. But while much has already been achieved, a lot more needs to be done. Scientists from the first two instruments to start operation described the progress so far and outlined what developments were planned for the instruments in 2018. Christian Bressler, leading scientist by the Femtosecond X-ray Experiments (FXE) instrument, listed the installation and commissioning of a silicon monochromator and associated components on the instrument optics bench as highlights for 2018, and called on more users to propose experiments for the next run. Adrian Mancuso, leading scientist at the Single Particles, Clusters, and Biomolecules and Serial Femtosecond Crystallography (SPB/SFX) instrument, said that the instrument’s focal size will improve further in 2018, and serial crystallography and single particle imaging techniques are already giving users reliable data at the instrument. While priority in 2017 was given to the development of the instruments FXE and SPB/SFX on beamline SASE 1, construction and commissioning on beamlines SASE 3 and SASE 2 as well as the next four instruments will be the focus this year. First lasing on SASE 3 is scheduled to take place within the next few months, and first users at the Small Quantum Systems (SQS) and Spectroscopy and Coherent Scattering (SCS) instruments are expected in mid-November. Early user experiments at the High Energy Density Science (HED) and Materials Imaging and Dynamics (MID) instruments on SASE 2 are scheduled for 2019. With HED and MID operational, European XFEL will have a total of six experimental stations available for users. In dedicated satellite meetings on Tuesday 23 January on the European XFEL campus, future users for the MID and HED instruments were able to discuss the current status of development and future operational parameters as well as explore experiment ideas and collaborations. “Excellent plenary science presentations in the morning were complemented by breakout sessions in the afternoon where user groups with a particular interest in imaging and dynamics experiments discussed specific experiments” explained MID group leader Anders Madsen. 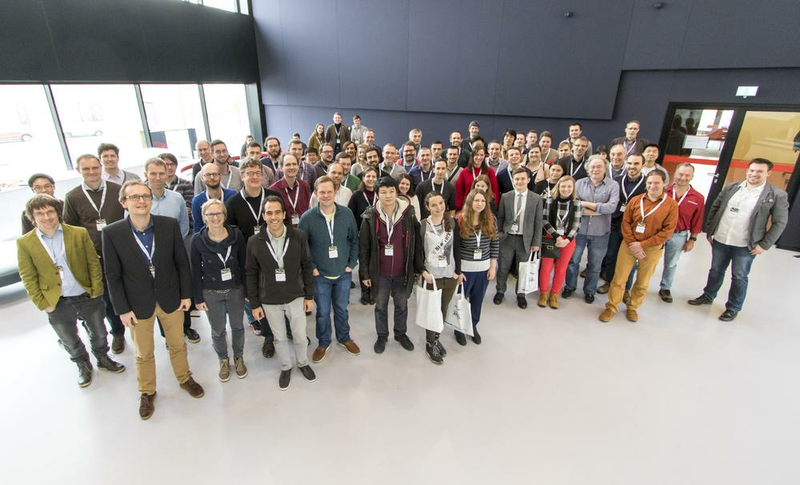 “It was great to see our future user community come together.” The HED satellite meeting was held together with the Helmholtz International Beamline for Extreme Fields (HIBEF) user consortium who contributes to the HED instrument. “I think this was a very successful meeting” said HED leading scientist Ulf Zastrau. “For the past several years we have held satellite meetings together with the HIBEF user consortium and it’s a good opportunity for everyone, users and scientists, to spend time together, both during the day brainstorming, and over dinner." The close contact to, and exchange with, the growing European XFEL user community has always been important for the new facility, and this will be reiterated with the establishment of a European XFEL user organization as announced by Feidenhans’l. “It is important to maintain and improve the contact with our users and get feedback about whether we are doing the right thing, and how we might improve procedures” he said in his talk on Wednesday. The next European XFEL and DESY Photon Science Users’ Meeting will take place in January 2019.